If transportation equity is defined as accessible, affordable transportation, should private auto ownership be a consideration? "A new study published in the Journal of Planning Education and Research...shows that over the past 50 years, owning a car has been among the most powerful economic advantages a U.S. family can have," writes Laura Bliss for CityLab. “There are a lot of people who keep struggling because they can’t afford to get around reliably," states David A. King, a professor of urban planning at Arizona State University and one of the paper’s [three] authors. To close the persistent and growing gaps between America’s haves and have-nots, King and his co-authors [Michael Smart of Rutgers University and Michael Manville of UCLA] suggest policymakers might simply help more needy people get behind the wheel, even as they promote less driving among affluent parts of society. It should be noted that Bliss begins her piece with the introduction last Thursday of the Green New Deal, a lofty plan for the nation to become carbon neutral by 2030, which would mean a transformation in the transportation sector, the largest contributor to the nation's greenhouse gas inventory since 2016. To make that happen, Americans will need to drive less, not more, as well as decarbonize transportation. Two all-electric car-share companies, GIG Car Share and Envoy Technologies, are working to launch their services in Sacramento funded by a unique Electrify America grant, report Tony Bizjak and Ryan Lillis for The Sacramento Bee. The grant program, administered by the California Energy Commission, is also available "throughout low-income neighborhoods in the Bay Area." 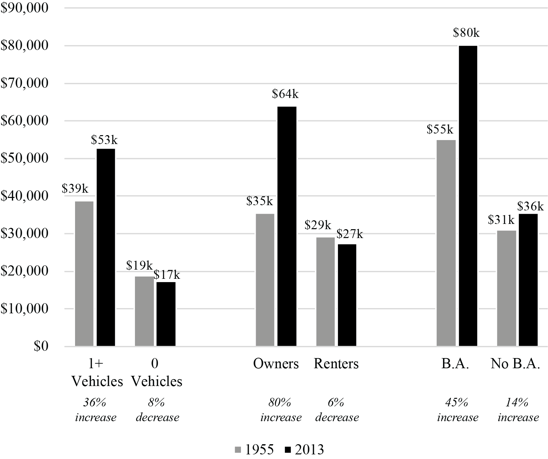 The new research shows "that U.S. households without access to a vehicle have steadily lost income, both in absolute terms and compared to those with cars, as the landscapes around them were increasingly shaped to favor the automobile," adds Bliss. Not having access to a motor vehicle is similar, in economic terms, to renting vs. owning and having a bachelors degree, illustrated by this chart. However, it's not just auto ownership but the urban landscape that influences the economic disadvantage of carless households. In Los Angeles, the quintessential auto-oriented city, the historic relationship between car ownership and income tracks alongside the nation’s, the paper shows. The correlation between vehicles and income is driven by the very low income of the carless. In New York City—the big exception to virtually every other U.S. city in that life without a vehicle is not only possible but logical—the fortunes of the carless are far less grim. The authors found that In Los Angeles, the average income of households without vehicles is 67 percent below the citywide average, while in the Big Apple, the average income of households without vehicles is only 20 percent below the citywide average. Clearly, a denser urban form with lots of transit options offers more transportation equity, but this study is aimed at increasing access to autos, not transit. Bliss points "to the major caveat to this study: It doesn’t try to capture whether a car is a catalyst for economic success...the study isn’t trying to establish a causal relationship—it isn’t asserting that not having a car makes you poor." But on its own, the data tells a story that leads the authors to a pointed policy prescription: Treat vehicles like essential infrastructure. Like water and heat, they argue, access to cars should be guaranteed and perhaps subsidized for low-income households. In April 2016, James Brasuell posted on a new study called "Driving to Opportunity" by researchers at the Urban Institute, the University of Maryland and UCLA. The key findings of the study, as explained by Emily Badger of The Washington Post: “The families with cars moved to neighborhoods with less poverty and were more likely to stay there. They lived in neighborhoods with less unemployment, higher median rents, more access to green space and lower levels of cancer risk." One of the study's authors, Rolf Pendall, wrote in a CityLab blog, "The importance of automobiles arises not due to the inherent superiority of driving, but because public transit systems in most metropolitan areas are slow, inconvenient, and lack sufficient metropolitan-wide coverage to rival the automobile." "What’s most frustrating about Pendall’s column and Badger’s article is the implication that transit advocates are somehow working at cross-purposes with the needs of low-income people," wrote Angie Schmitt of Streetsblog USA in a critique of the study.